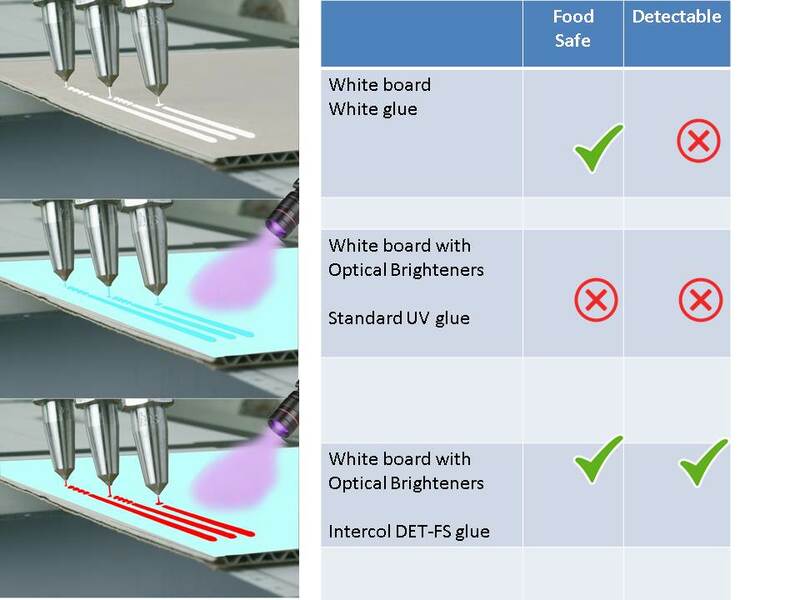 Glue detection systems are increasingly equipped with UV Sensors. This system contributes ensuring quality during production. Detecting with UV unfortunately also has some challenges. Optical brighteners in the paper cause disruption of adhesive recognition. The recycling of cardboard is related to increasing contamination of these Optical whiteners and creates scattering, as a result of which the adhesive recognition becomes increasingly problematic. Producing for the food industry is a problem with UV substances.. The current standard detectable adhesives are still not allowed for primary food packaging! Do you produce primary / secondary packaging for the food industry? Until now it was not possible to have an authorized UV detection substance with the current detection systems. Intercol adhesives has found a suitable solution in cooperation with the system suppliers. Our food-compatible SML 12 adhesives are now provided with the new range of UV substances so you can produce guaranteed food safe with the SML certificate. Our customers may wish to color the glue or make it suitable for UV detection, suitable for primary packaging. These requirements are also known to us and can be built into our adhesive recipes. Our food-safe SML 12 adhesives can now be equipped with a new range of UV detection devices, and you can be guaranteed to produce food safely with the Intercol SML certificate. Cardboard processors may want to provide their current glue with detection means, and food safety will continue to be observed. We are familiar with such questions and in consultation we can fit this into existing adhesive recipes. Application in EU food packaging. The above glue requirements, wishes and laws have been incorporated in an impressive series of adhesives that have earned their spurs in practice.